A new generation of e-cigarettes that use raw tobacco are as toxic as traditional cigarettes, researchers say today. The new "heat not burn" devices heat tobacco to release vapours rather than using the liquids that fuel vaping devices. But laboratory studies, conducted in Australia, suggest that heated tobacco is "highly toxic" to cells even at low concentrations. This is similar to cigarette smoke, the researchers report in the European Respiratory Journal's Open Research publication. The laboratory tests involved epithelial cells and smooth muscle cells taken from the lungs. The researchers found that e-cigarette vapour was toxic at high concentrations, such as might be inhaled by chronic smokers. “Our results suggest that all three are toxic to the cells of our lungs and that these new heated tobacco devices are as harmful as smoking traditional cigarettes." Dr Sharma added: “It took us nearly five decades to understand the damaging effects of cigarette smoke and we don’t yet know the long-term impact of using e-cigarettes. These devices that heat solid tobacco are relatively new and it will be decades before we will fully understand their effects on human health. The European Respiratory Society said the findings added to existing concerns about the new devices. * A second report today raises concerns about smokers being too reliant on vaping. Scottish researchers warn that vaping delivers "ultrafine particles" that can contribute to cardiovascular damage. 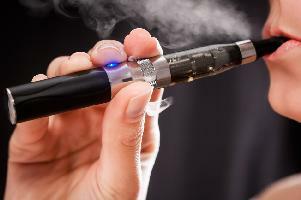 Writing in the Journal of the Royal College of Physicians of Edinburgh, the researchers warn against long-term vaping. Abhi Mathur, from Aberdeen Royal Infirmary, said: "Fewer people are smoking conventional tobacco cigarettes and more people are vaping. Smokers are asking healthcare professionals whether e-cigarettes are safe and effective for smoking cessation. Debate continues regarding safety of e-cigarettes, but NHS Scotland and England have concluded that vaping e-cigarettes are less harmful than smoking tobacco."